Ah, summer. 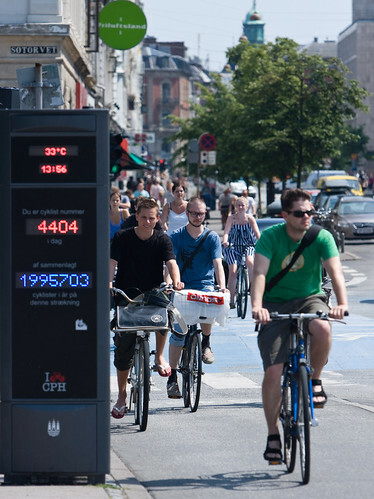 33 degrees, according to the bicycle counter on the western world's busiest bicycle street, Nørrebrogade. Out of 1,995,703 so far this year on this stretch. The counter is only on one side of the street, so at the end of the day you double the figures to get the total. This was taken in the early afternoon, so the homeward rush hour hadn't yet begun. Mikael -- who makes the counter, please?? Wondering if I can convince some folks in sunny California to sponsor one. Why not? @Peter - I second that motion! I too would LOVE one in California! Great to get some real summer weather. 33 deg. Cool. Or not. Those traffic counts are amazing to me. I can ride 20 miles from my house to my parents and not see another person on a bike.